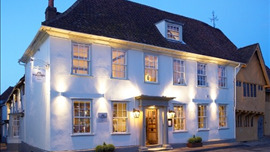 An elegantly appointed sixteenth-century coaching inn just off the A12, the Angel is now a serious and well-endowed venue that combines the virtues of a traditional pub and the attributes of a relaxed restaurant-with-rooms. The comfortable beamed lounge bars are highly popular for drinking and snacking; alternatively, book a table in the Well Room restaurant, which takes its name from a 60-foot well that holds pride of place in the centre of the dining room. Menus change regularly and the kitchen is happy to take on board ideas from France, the Mediterranean and the Far East: marinated Thai beef salad is served with root vegetable strips, roast duck confit comes with sweet potatoes and hoisin sauce, while slow-braised lamb shank is given the traditional treatment with mint and red wine jus. Passion fruit crème brûlée is a typical dessert and the wine list has plenty of serious bottles with attractive price tags.